The power of VISA is in your hands with a Genie Visa Debit Card. An active Universal Office account is all that you need to qualify.You and your immediate family can have the full, worldwide purchasing power of the VISA name, accepted at millions of merchants around the globe. From brick-and-mortar stores to Internet boutiques, you'll be welcomed everywhere VISA is when you have a GenieCard with the VISA Logo. The Genie Visa Card gives the features you need most from a bank account, with none of the hassles. A GenieCard account is perfect for someone just starting out, because you get the ease of ATM access and purchasing power, right from day one. If you already have a bank account, what could you possibly need with ANOTHER account like a GenieCard? Two words - "limited risk". 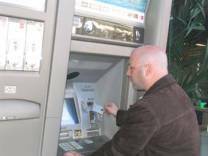 We all know how clever scamsters and crooks are these days - especially in the area of electronic banking. Fine - just use a GenieCard as your low risk account for those times when you question who you're dealing with. By limiting the funds in your GenieCard account, you've completely limited your risk. Just starting out? Haven't established your credit record? No problem! With the GenieCard, first timers are just as welcome as old hands. You can have the convenience of a traditional ATM card, with full access to your money all day, every day, AND the ease of a VISA Card, usable everywhere VISA is accepted. Black marks on your record won't stop you from getting a Genie Visa Debit Card, because there are NO credit checks. Everything you do with your GenieCard is pre-paid, so there's no worry about credit limits, late fees or any of the other irritations of managing debt. Instead, you get the freedom of plastic, without the worry. Are you in the upper regions of credit scores? More credit may NOT be what you need - just more convenience. And that's what you get with a GenieCard. A GenieCard is a great way to separate those special purpose finances that don't belong on your personal credit card, or even on your regular company cards. What do you do when you're looking for work, and you need a way to handle your money? Stick cash under your pillow? Certainly not! You keep it in a GenieCard account, so that you have full-time convenience with full-time safety. NOW you're ready to go with a place for direct payroll deposit when you get that job offer you're waiting for. A GenieCard lets you avoid the worries of juggling multiple paychecks and multiple paydays. Just use direct payroll deposit from any or all of your jobs, and you're ready to go. No paychecks to lose, no frantic runs to the bank. Ever been on the road on payday, and wondered if your check made it to the bank? Not with a GenieCard! With a GenieCard account, you know that direct-deposit happens on time, every time. And you also know that every dollar you need is accessible right away, no matter where you are. Congratulations! You've made it through the working world and come out the other end. Now it's time to relax a bit, and a GenieCard with the VISA Logo is the perfect tool. Whether it's your dream to travel the highways and by ways seeing the world, or to kick back and fish that little lake hidden in the hills, a GenieCard will make sure you're money is safe AND accessible when and where you need it. "Mom, Dad? I need money for[books, clothes, library fees, groceries, etc.]!" You name it and students need it. And YOU are going to pay for it. But why pay so much to pay so much? A GenieCard can save you boatloads of cash over traditional wire services when you send money to your child away at school. And you can give your student the convenience of VISA without the risk that they'll buy out the electronics store on an impulse and YOUR credit. It may seem quaint or old fashioned to some, but millions of people still send money home to family and friends abroad. And all too often they pay outlandish fees for the privilege. Not with a GenieCard! A GenieCard lets you send money to your family for a fraction of what "international transfer" services charge. Just going down to the corner store? 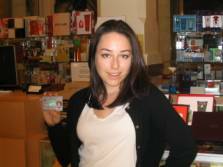 Odds are, the corner store now takes VISA, so be prepared with a GenieCard. No hassles with writing checks and no danger with flashing more cash than you meant to - just a quick, magic pass with your GenieCard. Shopping on the Internet lets you buy things from any place you want - from Austria to Zimbabwe and everywhere in between. But cash doesn't fit through that modem very well. Use a Genie Visa Card! You get the global reach you want, with the security you need. Paying cash is fine - cash makes no enemies. But CARRYING cash can make "friends " you don't want. So use a Genie Card instead. We'll carry the cash for you and you can pull out just what you need, when you need it, atany ATM. 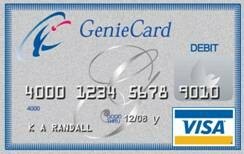 With a Genie Visa Card, you have all the power of a charge card without the downside of mounting bills. 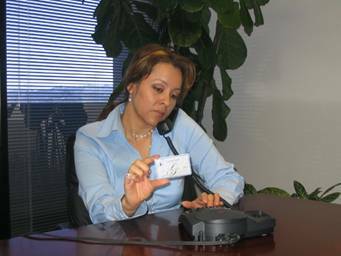 Merchants the world over will take your GenieCard, in person, by phone or over the Internet, so there's no limit to what you can buy. But the GenieCard is pre-paid, so there's no fear of piling up debt that will come back to haunt you.